HAVANA (AP) — Seventeen years ago, a newly named Argentine archbishop laid out his thoughts on the meaning of a papal visit to Cuba. "Through the presence, the voice and the prophetic mission of the pope, the church offers a path forward to peace, justice and true liberty," Jorge Mario Bergoglio wrote. "Not everything will be the same after he leaves." Millions of Cubans hope those words written about John Paul II's 1998 trip to Cuba prove true when their author, now Pope Francis, flies into Havana on Saturday. Across the island, Cubans are excitedly looking at the pope's 10-day trip to Cuba and the United States through the lens of his role as the mediator of detente between the two countries. Many say they expect the visit to help transform the diplomatic warming from a phase of abstract political negotiation into real benefits for the Cuban people. "The pope achieved the re-establishment of relations between the two countries," said Miguel Marcelino, a member of a worker-owned gardening services cooperative. "A big part of why he's coming is so that there's new momentum in that relationship." In a series of interviews across Havana this week, people almost universally said they would be at Francis' Mass in the Plaza of the Revolution on Sunday. Virtually none said they would attend because of personal faith. "I've never been to a Mass. I don't know what that is," motorcycle taxi driver Jose Manuel Echevarria said as he waited for a friend to return with an axle to replace one snapped by one of Havana's many deep potholes. He's going to the plaza to watch an event that he expects to have strong historical significance. "He's coming to Havana and then he's going from Havana to the U.S.," Echevarria said of Francis. "It's obvious, no? He's not going for any other reason." Vatican officials are cautioning that the pope's mission is pastoral, not political, saying people should expect no explicit diplomatic message. But some longtime observers of Francis said it is clear he sees the visit as many Cubans do — as the second stage of his role in midwifing normal relations between Washington and Havana. "Francis won't explicitly be political at all when he's here, but everything he does will be profoundly political in its implications," said Austen Ivereigh, author of "The Great Reformer: Francis and the Making of a Radical Pope." The pope feels the half century of hostility between the U.S. and Cuba polarized the politics of Latin America, forcing people to choose between Washington's and Havana's visions for the region, Ivereigh said. While the pope values the social achievements of Cuba's revolution such as free universal health care and education, he has staunchly criticized its decades of repression. He looks to healing the rift between the U.S. and Cuba as a way of steering the island on a path toward a new system that both cares for the needy and provides liberty while avoiding the excesses of capitalism, providing a potential model for the region. "He has a very ambitious vision for Latin America, and Cuba plays a key role in that," Ivereigh said. Francis has downplayed his role in the detente, saying he did "only little things," but both Presidents Barack Obama and Raul Castro praised the pope in their Dec. 17, 2014, speeches announcing the deal. Obama noted the importance of Francis' "personal appeal" to both leaders in a pair of secret letters at a critical stage in the 18 months of secret negotiations. The Vatican also hosted the final meeting last October at which the two sides finalized the deal. 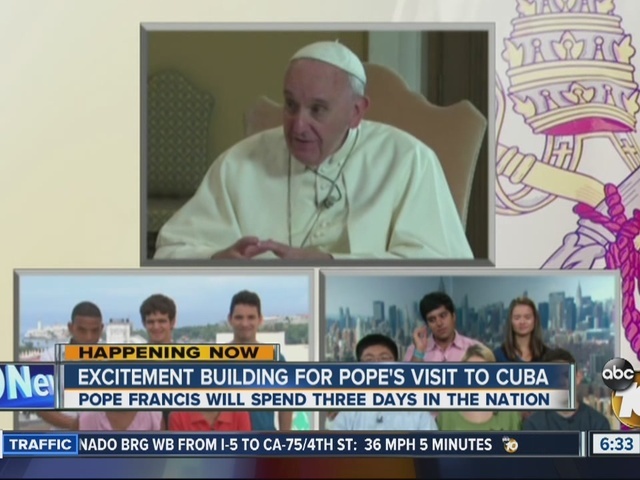 Francis has never been to Cuba but has a veritable Cuban brain trust in the Vatican. The head of the Vatican's congregation for priests, Cardinal Beniamino Stella, and the No. 3 in the Vatican secretariat of state, Monsignor Angelo Becciu, both served as ambassadors to Cuba during a period when the church was finding new freedom to operate on the island. Maltese Monsignor Antoine Camilleri, the Vatican's undersecretary for relations with states, served in its embassy in Havana in 2005-2006. "When you think about the whole Cuba question, the Holy Father had to have a desire to do something about Cuba-U.S. relations that is longstanding," said the U.S. ambassador to the Vatican, Kenneth Hackett. He is a former president of Catholic Relief Services, the official overseas aid agency of the U.S. Catholic Church that has been an important player in the growth of the church in Cuba. For Obama, Francis' involvement served as crucial political cover for a move that would have once been politically impossible in the face of objections from anti-Castro Cuban-Americans in Florida. "His involvement injected an element of credibility and authority that was important to help the president, knowing that he would be criticized by some." said Tim Rieser, a foreign policy aide to U.S. Sen. Patrick Leahy, a Vermont Democrat who has been a key player in the push to improve relations between the U.S. and Cuba. "The pope helped move the process forward," Rieser said. "He was the right person at the right time." Raul Castro has spoken kindly of Francis, a fellow Latin American sympathetic to many of the ideals of Cuba's revolution: social justice, nationalization and an antipathy to U.S. global hegemony. The pope's backing of detente with the U.S. likely provided a crucial element of reassurance to Castro, whose communist government has long confronted its powerful neighbor. "He's a man he can trust and a global organization with the heft to carry through," Ivereigh said. "It is really that that explains the greatest diplomatic success for the Vatican in a generation." Associated Press writer Michael Weissenstein reported this story in Havana and Nicole Winfield reported from Rome.